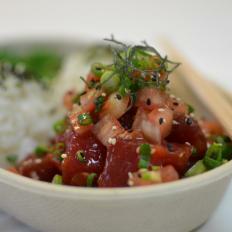 Chef, prolific restaurateur and Food Network star Sam Choy may not have invented poke, but the Hawaiian chef fueled its popularity on the mainland with what started as a fleet of food trucks, Poke to the Max. Choy still has a few trucks, but he also has a brick-and-mortar shop in Seattle’s Hillman City neighborhood. At the shop, rice bowls, salads, tacos and wraps are filled with fresh ingredients and diners’ choice of protein, including tofu, traditional salmon and spicy salmon as well as ahi tuna, which is available in traditional, furikake or spicy versions. Some of the dishes are offered with a side, such as edamame hummus, green salad, seaweed salad and Japanese-style pickled vegetables called namasu. The shop’s tagline is "Mo Poké, Mo Betta!"